On 3 February 2015 the United Nations International Court of Justice (ICJ) delivered the verdict in the landmark case «Croatia vs. Serbia». The ICJ decided that neither Croatia nor Serbia committed genocide against each other during the war of Serb aggression against Croatia 1991-1995 as evidence provided to the court by the Croatian (and Serbian) legal team was inadequate to prove intent of genocide, i.e. to destroy the whole or a significant part of a nation/people. Furthermore, the court decided that Serbia could not be made responsible for the acts of genocide established as fact which occurred prior to April 1992, when Federal Republic of Yugoslavia (FRY – Serbia and Montenegro) arose from Socialist Federal Republic of Yugoslavia (SFRY). After the declarations of Slovenia, Croatia, Bosnia and Herzegovina and Macedonia to secede from communist Yugoslavia, Serbia and Montenegro were the only states of former Yugoslav federation that took upon themselves the pursuit as “heirs” of communist Yugoslavia, thus maintaining the Yugoslav People’s Army as one of its instruments of aggression. The other instrument of this aggression and genocidal intent were the Serb nationals who lived in Croatia and Bosnia and Herzegovina and turned into rebels against independence that would see untold brutality and destruction in Croatia and Bosnia and Herzegovina. The ICJ did find that Serbia was the aggressor against Croatia. With mountains of evidence available to the Croatian legal team to bring before the ICJ as evidence of genocide the fact that the same team failed to bring adequate evidence before the court can only point to abysmal sabotage and fowl political play that seeks to equate the aggressor with the victim. Croatian legal team obviously provided no serious evidence to substantiate the claim that there was intent to commit genocide on its territory, in particular by Serbia, even though acts of genocide were committed and were widespread. When a legal team whose duty it is to provide evidence that substantiates claims in court fails to choose the proving evidence to present to the court from the mountain of evidence available then you know that sabotage is afoot. The International Court took into consideration all the evidence related to each point of the definition of genocide and ruled that there was no evidence to support the claim. How just is the ruling? The only “justness” would seem to arise from the fact that such a ruling was sculptured in advance of the trial, which would utilise political manoeuvring in changing the name of the defendant – from FRY to Serbia – thus ensuring Serbia a ground to argue that it, as a state, was not responsible, not a subscriber to the UN Genocide Convention, to any acts of genocide perpetrated between 1991 and April 1992 (and this was the time when both the intent and the ferocity of acts of genocide were committed systematically in Croatia by the Serbia/Montenegro led FRY, which controlled the Yugoslav People’s Army of former Yugoslavia). Also, by ensuring that evidence presented by the Croatian side in court was both lacking and often unacceptable (e.g. unsigned affidavits or statements!). According to the United Nations International Court of Justice, the acts of genocide established in the court all happened without special intent of genocide! The more powerful International Criminal Tribunal for the former Yugoslavia (ICTY) had already established a lot of facts of Serb aggression, which included numerous and systematically perpetrated criminal acts of genocide and ethnic cleansing of Croats and other non-Serbs. At present the ICTY is considering the case of Goran Hadzic, former president of the so-called «Republic of Serbian Krajina /Republika Srpska Krajina» («RSK») in Croatia where a great deal of the acts of genocide were committed against Croats and Croatia prior to April 1992. Milan Martic, another former president of the unrecognized Republic of Serbia Krajina, is serving a 35-year sentence according to the Tribunal’s ruling. Milan Babic, the third president of the Republic of Serbian Krajina, admitted guilt and made a plea bargain with the prosecution. He testified against his former associates and the Serbia’s leadership. Babic was found hanged in the prison cell in 2006, an apparent murder. The fact that he killed himself was supported by evidence. It seems that a great deal of effort was applied by the so called international justice to come up with a new version of events that took place during the former Yugoslavia conflict to let anybody meddle in and change the story. But this effort was evidently propped up by certain Croatians who held high positions soon after the death of Croatian first president Franjo Tudjman in 1999 and these were the Croatians most of whom stood by communist Yugoslavia and did not want an independent Croatia in the first place. In support of Serbia’s counterclaim, the court heard that there was no Serbia as a separate state at the time (1991-April 1992) as it was part of the Federal Republic of Yugoslavia (FRY), which was later transitioned into Serbia and Montenegro. The Court never explained why all of a sudden Serbia became a defendant in that case which was originally filed against FRY and Croatia’s legal team failed to adequately argue similarities between the two, i.e. in essence, inseparable legal entities when it comes to the people responsible for crimes committed. 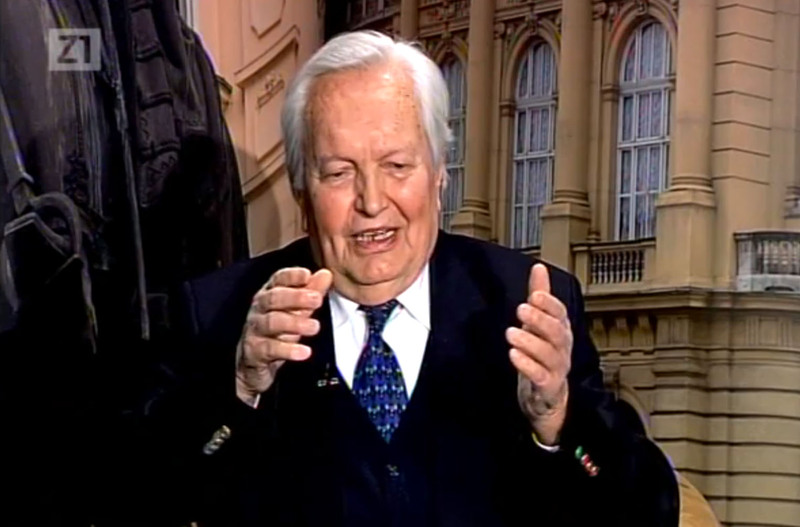 On 5 February 2015, Zagreb1 television program “Veterans Today” interviewed prof. dr. Zvonimir Separovic, who was the justice minister in Croatia at the time the original lawsuit for genocide against FRY was filed with the ICJ in 1999. Dr. Separovic compiled the genocide claim with the aid of David Rivkin, a leading US attorney. Dr Separovic stated that the Claim had then been changed starting with Ivica Racan’s social democrats government (former League of Communists) and subsequently changed even more to suit Serbia – he points the finger at Stjepan Ivanisevic (Racan’s justice minister), Ivan Simonovic (Racan’s deputy foreign minister) Ivan and Ivo Josipovic (former social democrat/League of Communists, attorney and current outgoing president of Croatia). This team, along with their political partners had changed the original Claim filed by Croatia in 1999. They removed FRY as the defendant i.e. removed Montenegro from the equation (even though quite a number of Montenegrin officers and soldiers served in the Yugoslav People’s Army at the time of aggression against Croatia) and inserted Serbia alone. Not only that, this team of legal professionals had removed the Second pleading from the original Claim, which dr Separovic says had in it that Serbia ordered the withdrawal of some 100,000 Serb nationals from Croatia, after the acts of genocide against Croats had been committed and the removal of this point from Croatia’s original Claim was, according to dr Separovic, done with view to enabling Serbia to mount a counterclaim in which it (wrongfully) said some 200,000 of Serbs were forcibly deported from Croatia in 1995. A book/memoir written by Radivoj Cvjeticanin (“Zagreb Indoors”), a former Serbia’s ambassador to Croatia, from page 231 reportedly talks about meetings with Ivan Simonovic and Ivo Josipovic which point to the Croatian players seeking advice and instructions from Serbia as to how to approach and what to say at the international court of justice – how to best relativise the Claim to aid Serbia! There’s only ten days left of Ivo Josipovic’s presidency in Croatia and he is contemplating his future career, including returning to his previous position as law professor at University Of Zagreb. This would seem a most opportune time to commence lustration in Croatia and prevent any such person as is Josipovic taking up an important seat in the country’s education system, or any other system for that matter. The disloyalty to Croatia evidenced in the above is scandalous and unacceptable. One must ask: how can a law professional (Ivo Josipovic) who has evidently been heavily involved in sculpturing the human injustice that came out of the ICJ judgment (through adverse changes to original lawsuit Claim and through biased and inadequate selection of evidential material to be presented to the court as evidence) be permitted to represent Croatia in any official capacity at all? Surely, this cannot be permitted. « Croatia v Serbia: ICJ Establishes Criminal Acts Of Genocide But Finds No Genocide Proven! It’s said that the ruling of the court in the Hague leaves sufficient ground for interpretations which is rather a bad news than a politically correct neutrality aimed at boosting the reconciliation process. In this way, the crimes are left to the conscience of the political elites at the moment or in the future in the region but also in the EU which was a direct observer of the events in the beginning of the 1990s and a participant in finding a peaceful solution. So, apart from insisting all countries in the region to persecute the war crimes, the EU should also demand from the political elites to condemn the crimes of the former regimes. The ICJ has done absolutely nothing to advance peace and justice in this case. It founds acts of genocide only to rule there was no genocide by sheer chance of using the outdated definition of genocide that arose in 1948 after WWII. Shame on them! Roots, thank you on your comment and I agree. What is the definition of genocide? What are the criteria before acts can be classified as genocide. I think the most important aspect of this whole court case is the lack of “will to win” on the part of the Croatian legal team. If they did not perform to the best of their abilities (because they were told not to?) or because they willfully sabotaged the case then that is tantamount to treason. What are the names of the lawyers that worked on the case? Ina, your conspiracy theories have no basis. Effective litigation requires excellent advocates who know how to argue a case and Crawford (unlike Crnic-Grotic or Damaska) is exactly that. He is a top tier international law expert and an outstanding barrister. Importantly, what you fail to mention in your quote of the convention is the crucial element of genocide: the intent to destroy. If there is no such intent on the evidence, there is no genocide. Killing hundreds with intent to displace them is not genocide, you have to have evidence that the intent was to destroy (think about the Holocaust). Luckily, there was no genocide in Croatia and I am still slightly bewildered about why people actually seem to wish there was genocide (in which case the ICJ would have ruled accordingly). Pluto, this is it! Just read the interview with prof. dr. Mirjan Damaska, prof. at Yale and expert in intl. law who was removed from the Croatian team and you will see. I hope Ina will translate it for you all. In a few words: we could have had the same verdict as in the Bosnia vs. Serbia case, i.e. that Serbia is responsible for not PREVENTING genocide, particularly in the area of eastern Slavonia. The politics, that is Josipović, Pusić, Šimonović did all to prevent even such outcome. Btw. ‘full’ genocide would have not passed as it is almost impossible to win the case with such a narrow definition of it. Budding in here, Klara – Damaska’s mention of political influence in legal team has a lot of meaning and why the current government chose British legal consultants is a ground open to many reasonable adverse speculations… while the verdict may not have been different with a different team it does bother as to how quite bit of evidence presented was not accepted by the court – the team must have known that in advance as standards are quite clear so why file unverified or unverifiable statements etc at all!? This was calculated rather than stupid in my opinion. Very disturbing, very disappointing and unfortunately very predictable outcome. Yes, now all fingers are pointed at both SDP govts. (Racan’s and Milanovic’s) and their alleged manoeuverings and connivings in order to sabotage Croatia’s case against Serbia – but when all the dust settles, what will be the real ramifications for those involved? Will anyone(HDZ) hold those publicly named individuals responsible – will investigations be mounted, will lawsuits be filed? After all, these people have been accused of treachery and as such, if found guilty, there could be no greater criminal consequences. But lets not just stop at SDP and their political culpability, there is enough blame to go around. When the Croatian constitution legitimizes/justifies and asserts to the world that Tito’s Communist Yugoslavia was the rightful precursor of modern Croatia – then you have a BIG problem. Just to restate: Tito, his Partisans, his Communists, his regime – is now formerly ensconced in the most important document that we as a nation possess.That was at the very least a massively stupid misstep or at the very worst a calculated treasonous act. Where was the logic – we voted 97% for secession from Yugo, we fought a war against Yugo, but still we recognize our enemy and thank him for our persecution of the last 45 years by their honorable mention in our constitution! Thank you Mr. Tudjman and HDZ. When the supposed political right is full of lefts(leftists) then you have another BIG problem. HDZ was so full of Communists in the early 90’s that to call them right wing (desnicari) was a misnomer. Was there ever a case where a person was refused membership? It seemed like no political pedigree was too bloody to be accepted. Coming from a former communist system, it would be understandable that membership would include former card carrying communists – BUT – when key political/military/judicial etc. positions were retained by or filled by those who were notorious stakeholders in the former regime then the problems can and did only get bigger. Thank you Mr. Tudjman and HDZ. When those thousands of insurgents who could have stood trial for waging war against Croatia and Croatians were unilaterally granted amnesty from future prosecution- and were thereby free to be employed as civil servants, as policemen, as the representatives of the govt. against which they fought — more problems -thank you Mr. Tudjman and HDZ. These few examples are used to point out that no political party or leader is blameless and that we owe it to ourselves to hold accountable those whose actions/decisions had negative consequences whoever they may be and from whatever political option. If nothing else, these revelations into the behind the scenes manipulations of SDP should be a warning to us to be vigilant in overseeing and holding accountable those who we empower. Yes Velebit, antifascism is mentioned in the Constitution as a foundation for independent Croatia and obviously that must be removed for what happened after the constitution was sealed was the brutal war and after it peaceful reintegration of Eastern Slavonia etc by 1998 then Tudjman died – obviously not having time to ponder on the mistake made with antifascism in early days for as it happened after the war we know that the foundations of independent Croatia lie with the war veterans etc… much work lies ahead including taking the amnesty given top suspected and known criminals away.. The theory of legal vacuum until April 1992, the definition of genocidal intent and counting ratio are a shame. Serbia is successor to Yugoslavia in every regard but not when it comes to attacking other countries? 16,000 dead (least we forget an additional 7,600 dead Croats in BiH) 145 mass graves and over half a million refugees/displaced people in RH is an insufficient number of victims to speak of genocide? Although the court acknowledged acts of genocide, they dispelled genocidal intent as there were not enough killed. The truth is we defended more than was allowed (who remembers the arms embargo). If we had defended as everyone expected, there would of been a second Bleiburg, with figures of hundreds of thousands dead which according to these judicial games would then constitute genocide? Is it too bad they could not wipe out all 4.5 million of us? Its as if they want to make us believe that if we had not so furiously defended, Vukovar would not be so destroyed? If we immediately surrendered, there would be no Ovcara? Was it that difficult to prove that in addition to those killed at Ovcara in Vukovar actually ALL killed, raped and expelled were on one psychological level part of the monstrous Serbian plan? The reality is the distribution of these acts of genocide (actus reus, which the court acknowledged) were not isolated cases, yet took the form of a continuity throughout the whole country. But what can we expect when the whole suit was sabotaged by out own fifth column yugo scum, after they did not unsucessfull in throwing out the whole suit. …why would this Josipovic, Racan, Milanovic et. al. seek to sabotage Croatia in these genocide trials at the Hague? Why would this so-called “Dr.” Josipovic, want to be under the Serbian jackboots forever? Why would someone want to be branded a “useful idiot” by the Serbian communists? The Royalist Jugoslavia and Tito’s Jugoslavia were just a “non de plume” for a Greater Serbia anyway! Josipovic, as for his being a “legal expert” on international law…well, I don’t think so! But, as stated before, you have to respect the Serbians because they………………………. …KILL THEIR TRAITORS! I have one word for all of this and its called equalization. This is something that was in the works for quite some time that I elaborated on this post a while ago while defending Gotovina et el. Does that mean I agree with he verdict? absolutely not. But the big picture for the ICJ was to protect many powerful people and countries that had a hand in our defense. We all know that powers in the USA / Britain etc would have been subject to the courts trial for the defense in Croatia and Bosnia and that Israel would have had to been accountable for violating arms embargo when they shipped weapons to the Serbs that killed many people. Being that this war was the largest in scope since ww2 there are a lot of interests by certain groups not to equate it to the same level for political and historic reasons. None the less we have every obligation through any means possible including out side of law to hold all of those who harmed our country and people accountable. I do hope though, Michael, that those “foreigners” who committed or added to or participated in war crimes or allowed them to occur… will come before the courts sooner or later. The verdict at ICJ does not preclude that and it certainly is a record of atrocities that did occur. There are Winds once Again coming from Serbia telling Croatia ” you have no rights to indepedence we will return you by force ” will Croatia defend itself once Again ?